AHS Latin teacher, Rachel Kirtley, was awarded a New Teacher Commendation, one of only four teachers in the state. AHS French teacher, Véronique Lahey, presented her first ever session at MaFLA, discussing the amazing Café Parisien that she developed for her French 4 classes. New AHS Spanish teacher, Christina Toro, worked hard collecting signatures for a letter to DESE Commissioner Chester to support foreign language education in her role as MaFLA Advocacy Intern. She also presented two sessions, one on advocacy and another on her experiences during her summer exchange in Uruguay, funded through a state department grant. World Language Director, Catherine Ritz, was nominated to the role of 2nd Vice President of MaFLA, after being a member of the Board of Directors for the past year. She also presented two sessions on technology, one of which focused on the use of iPods in the classroom, which were purchased through an Arlington Education Foundation grant last year. All teachers had a chance to meet the Massachusetts Teacher of the Year, French teacher Kathy Turner from Sharon High School! Of course, professional development can only be considered valuable if it is directly connected to student learning. That's why we will be using our next department meeting time to discuss how to apply what we learned in a broad and collaborative way. For example, AHS Spanish teachers Emmy Robinson and Sami Eladhari attended a workshop by the nationally known Zachary Jones on authentic resources. Using a team-based approach, we plan to work in groups to cultivate authentic resources--such as music, news articles, commercials, art, and more--and develop communicative activities to be used in all levels. I'm proud that the World Language department here at AHS is home not only to teachers who are serious about professional development, but who are also leaders and at the forefront of foreign language teaching. Bravo! 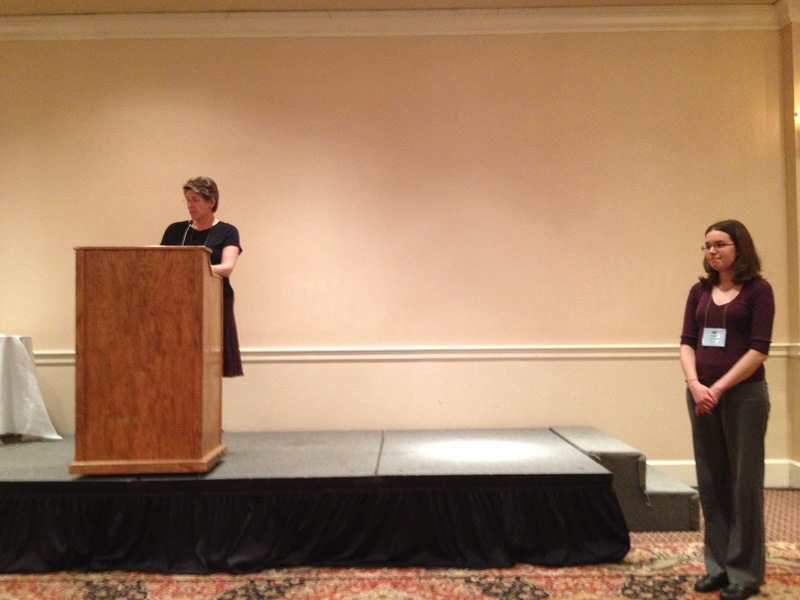 Latin Teacher, Rachel Kirtley, receiving the New Teacher Commendation from MaFLA Past President, Nancy Mangari. Spanish teachers, Emmy Robinson and Sami Eladhari, spoke with Zachary Zones during a session on authentic resources. Spanish teacher, Tara Kfoury, and French/Spanish teacher, Anne Zachary, looked for new resources in the exhibits hall. French teacher, Véronique Lahey, presenting on the Café Parisien. Spanish teacher, Christina Toro, and World Language Director, Catherine Ritz, spoke with Massachusetts Teacher of the Year, French teacher Kathy Turner of Sharon High School. Spanish teacher, Christina Toro, and World Language Director, Catherine Ritz, with MaFLA Advocacy Liaison and Past President, Dr. Nicole Sherf of Salem State University. New Language Lab @ AHS!